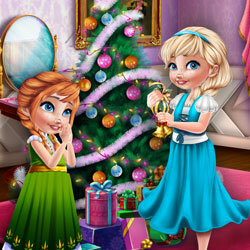 Description: Join the adorable duo, Elsa and Anna, on their quest to prepare for the holidays! The castle's living room is in a big mess so you better find the magical items to clean it up! Once you're done decorate the room with beautiful Christmas trees and dress the two sisters in cute outfits for the big Arendelle festival!